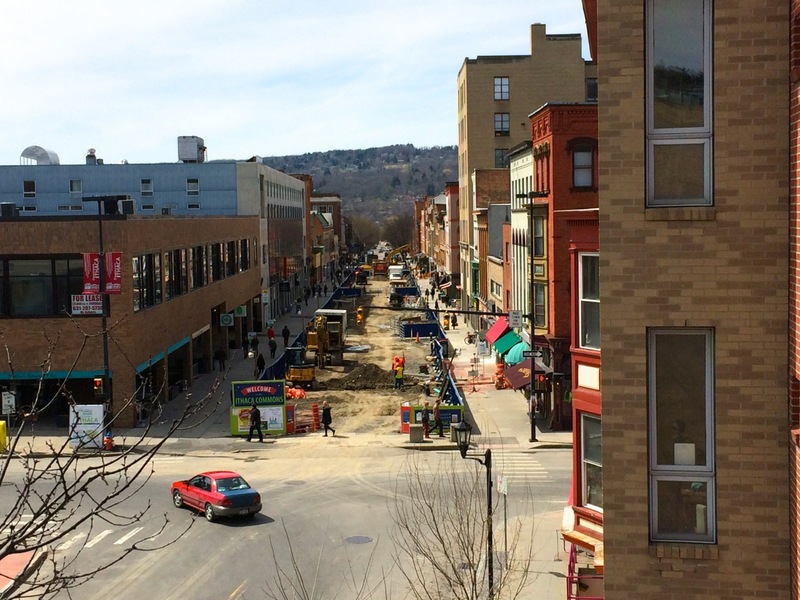 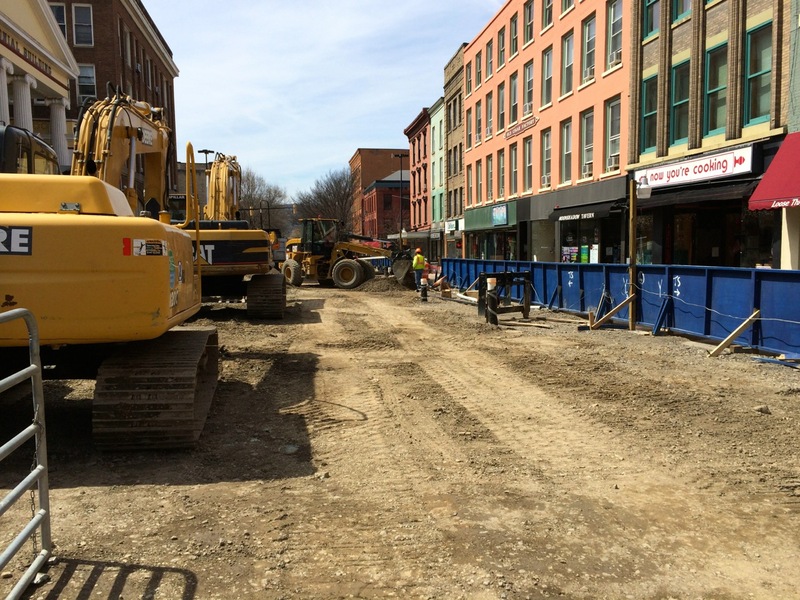 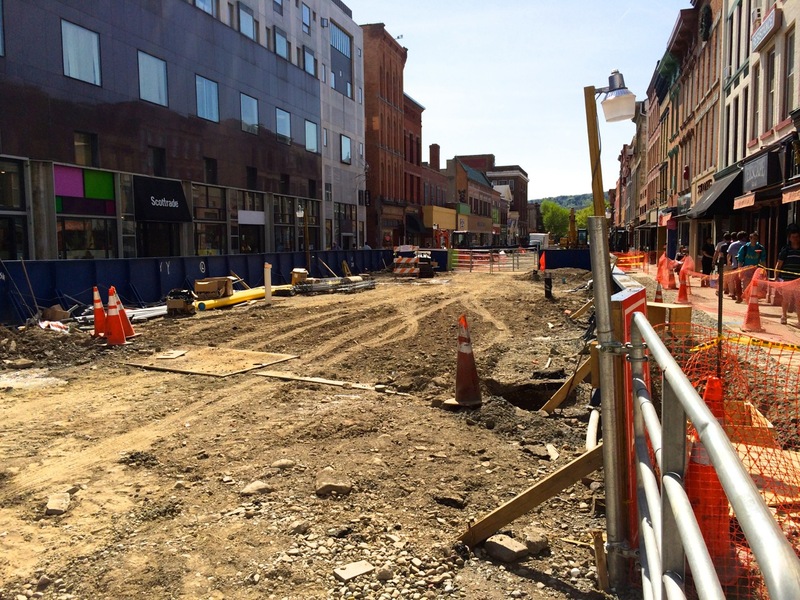 The Ithaca Commons Rebuild Project Team gave a presentation this morning on the phasing for this Summer and Fall (Phase 3), as the paving and the bulk of the remaining work wraps up this November. 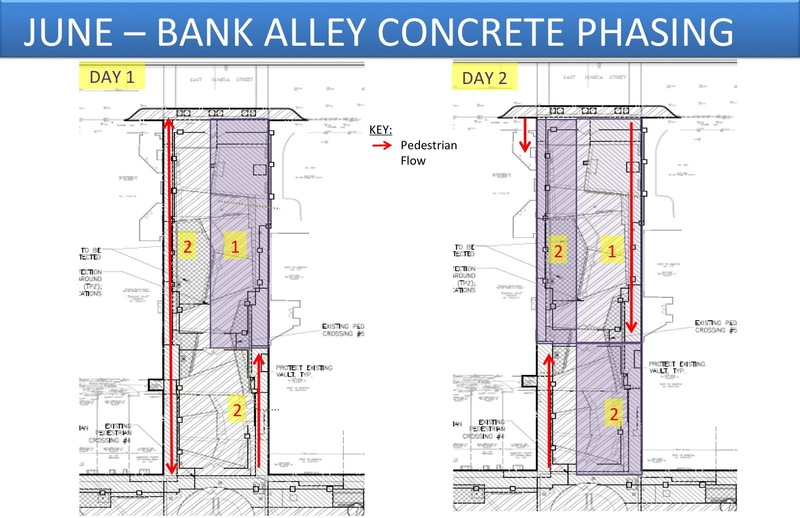 Michael Kuo, the Project Manager has agreed to share slides from the meeting that help to explain the rest of the project. 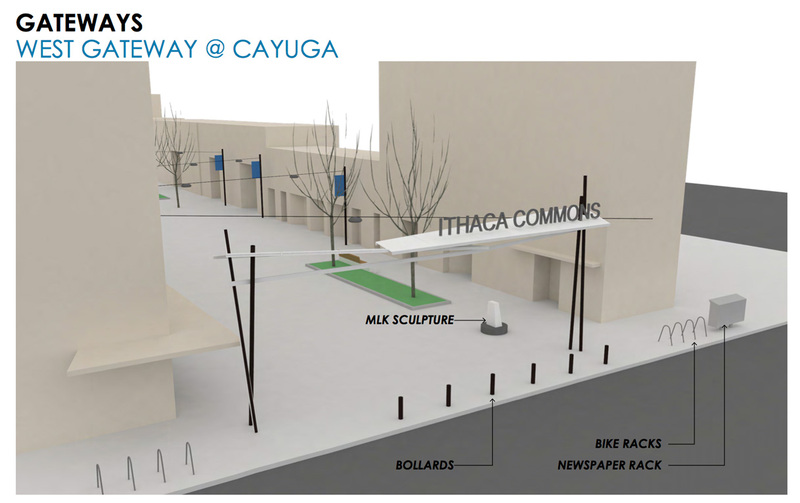 As was reported in the news and at the meeting, the team was able to value engineer certain portions of the project in order to re-integrate the gateway structures, and playground, which is being designed by Play by Design, a local firm specializing in custom playgrounds that has built hundreds of projects throughout the world. 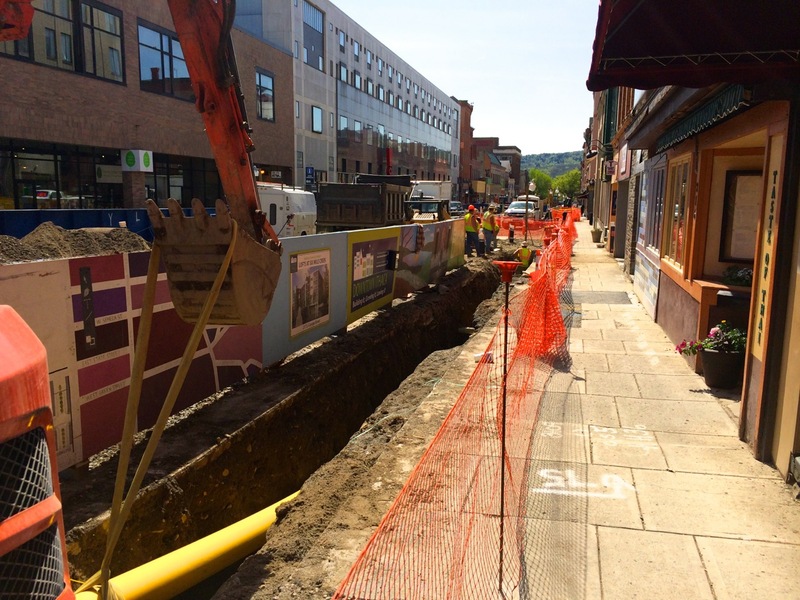 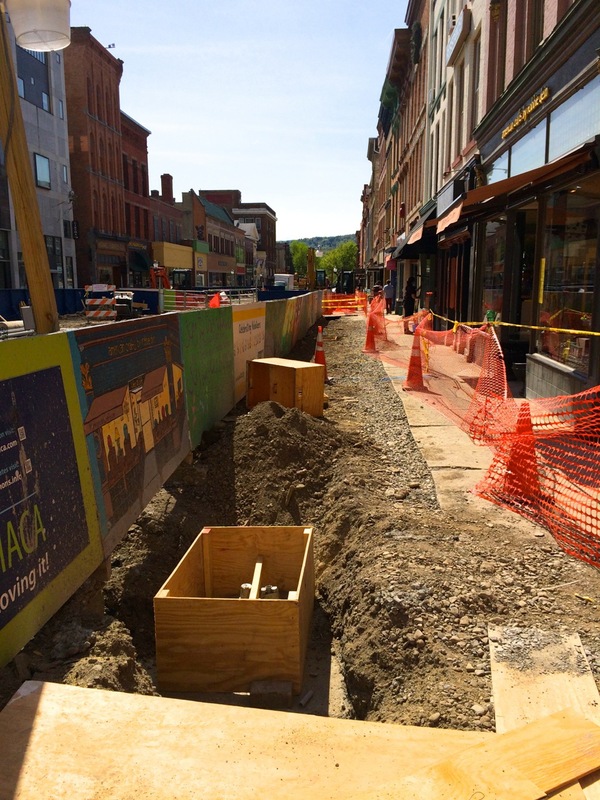 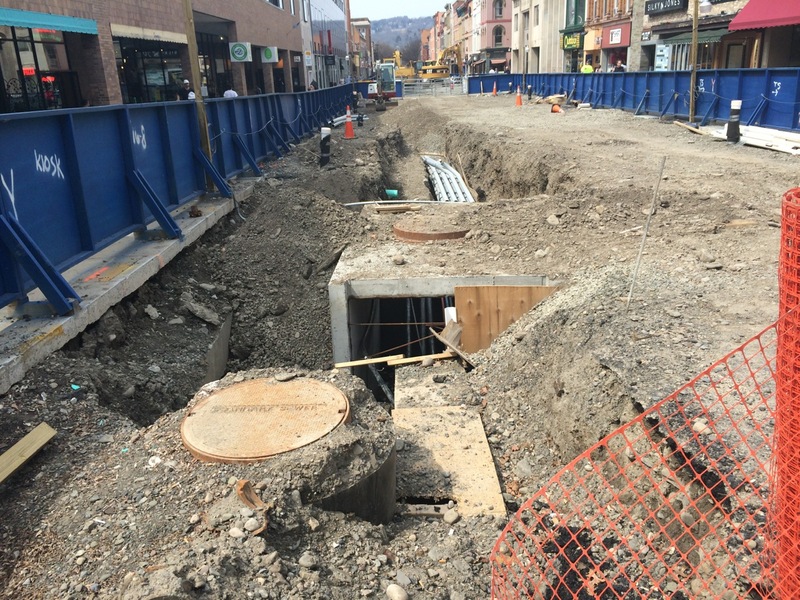 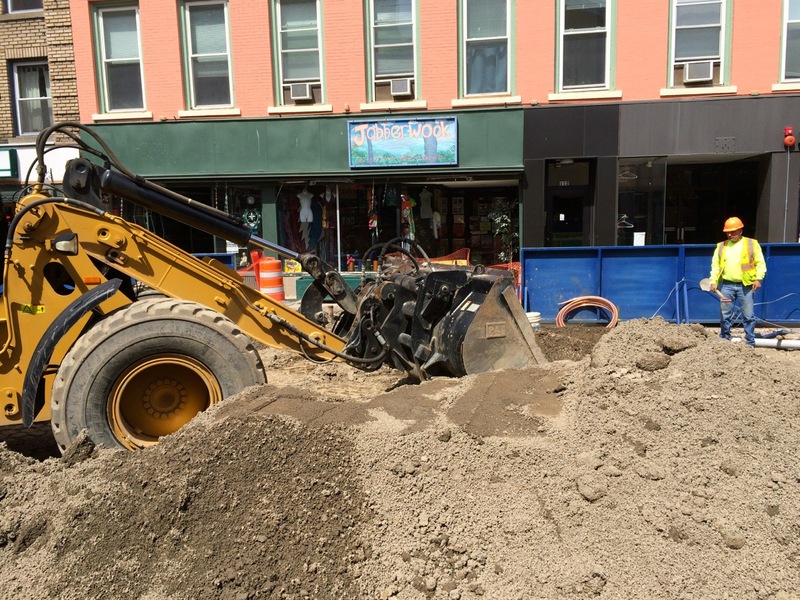 The City of Ithaca has agreed to install the mechanical vault and run plumbing lines for the future water feature, which is expected to attract donor funding to build at a point in the future. 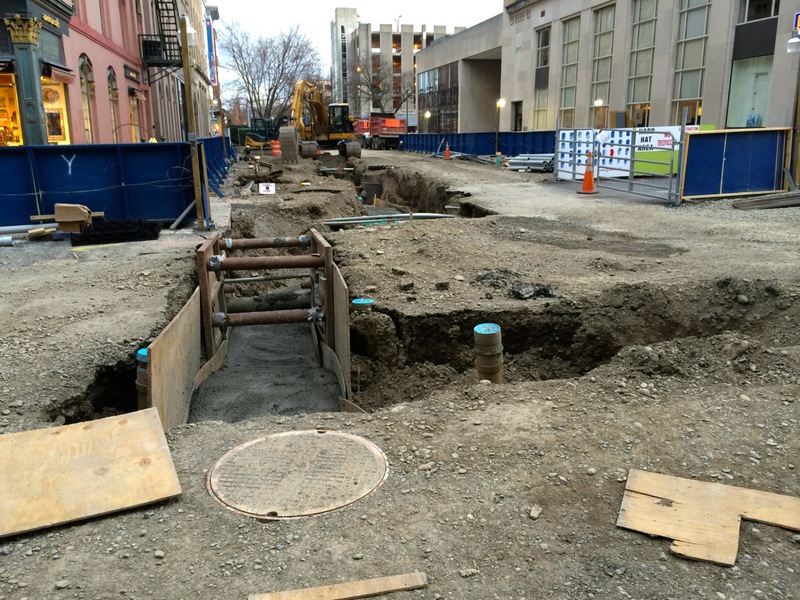 In the last six weeks since work resumed in earnest, the telecom mains and services have been run, along with water service upgrades that have involved digging-up and connecting the mains to water, fire sprinkler system lines, and telecom piping into each building (commonly called “laterals”). 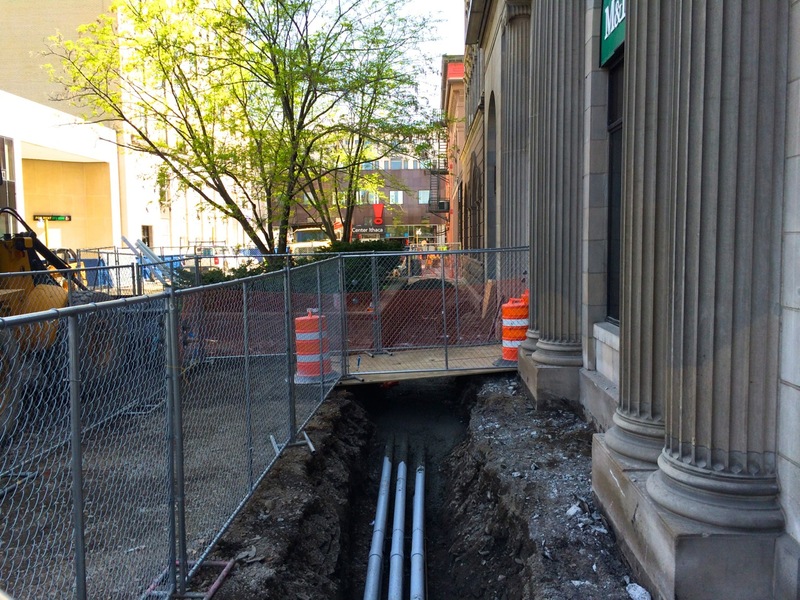 Once connected, the piping is tested and then the old services disconnected and taken out. 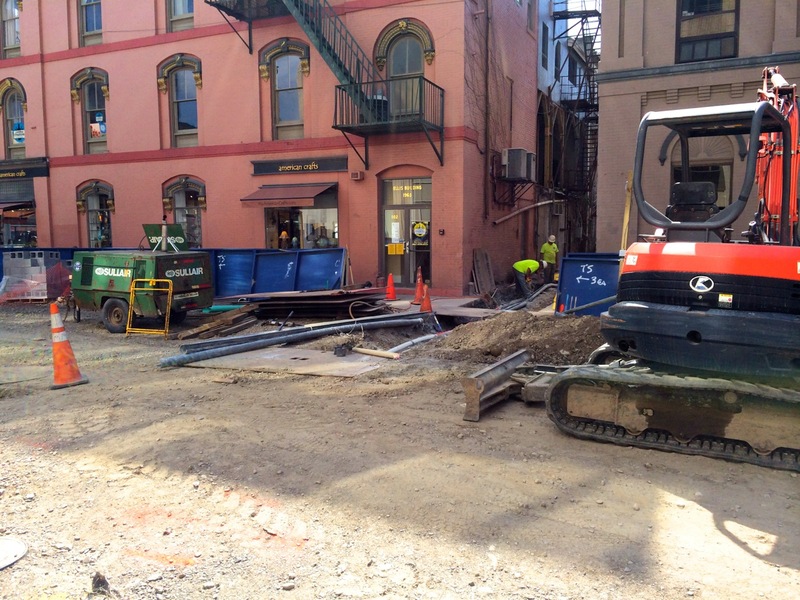 The crews have averaged about 2-3 each day. 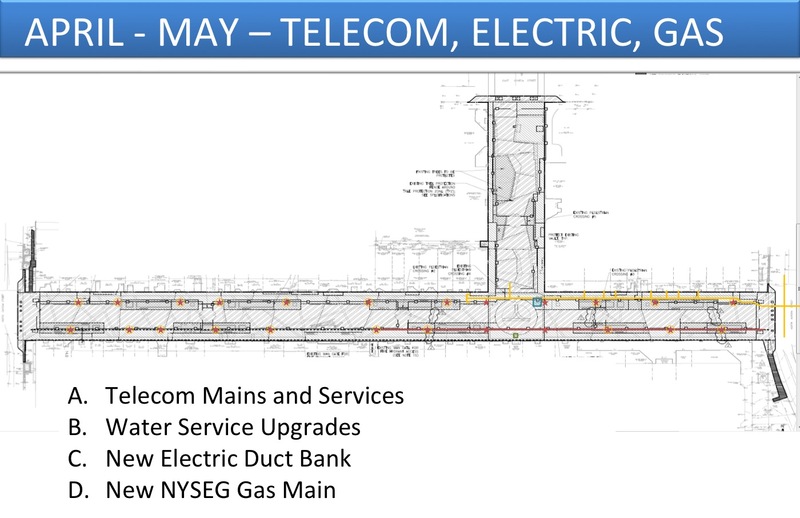 A new electric duct bank is currently being installed by NYSEG, along with a new gas main, replacing the old galvanized steel gas piping with high density polyethylene yellow gas pipe (HDPE), a similar material to plastic bottles actually, but much stronger. 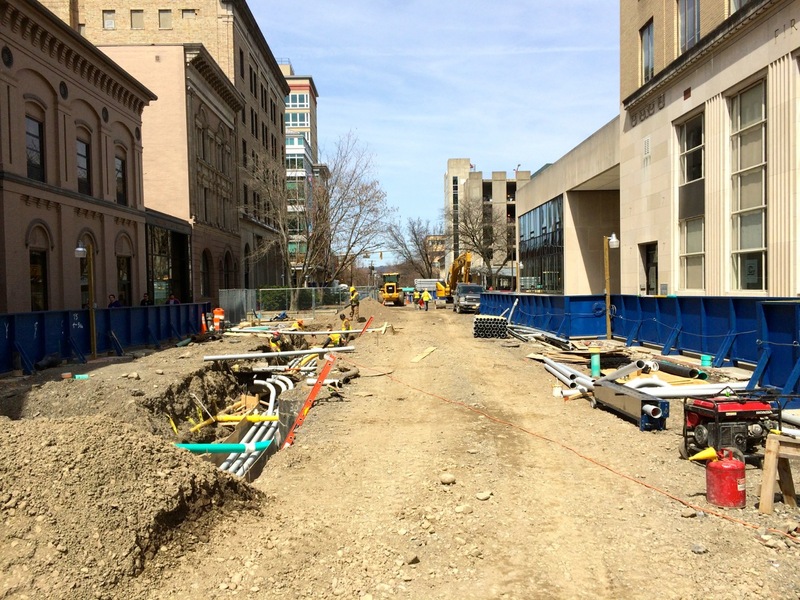 After the gas main section is replaced on the 200 Block’s north side, NYSEG will then cut open and replace the lines on the south sides of both blocks, then back around the northern side of the 100 Block from the west. 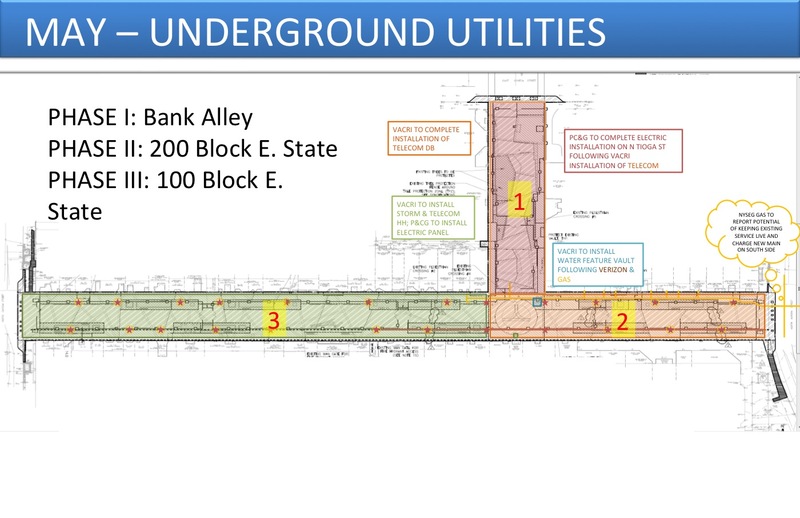 As the underground utilities are completed in each wing of the Commons, the paving program will begin in July, as crews will grade and prep surfaces for pouring a concrete base, on top of which, the concrete surface pavers will be set for the final walkable layer. 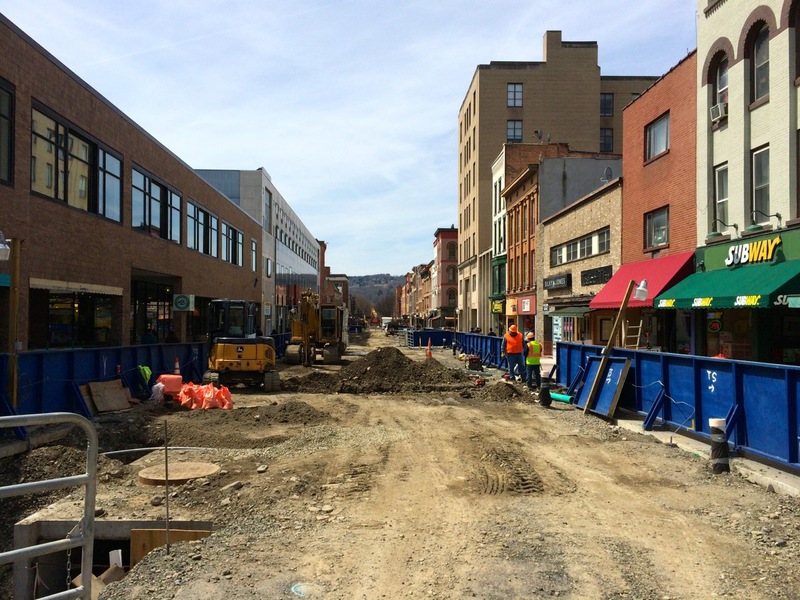 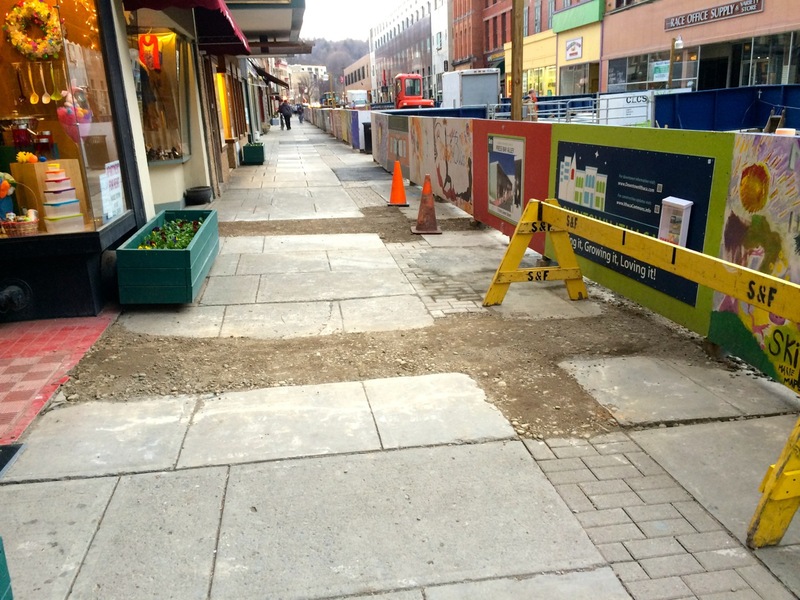 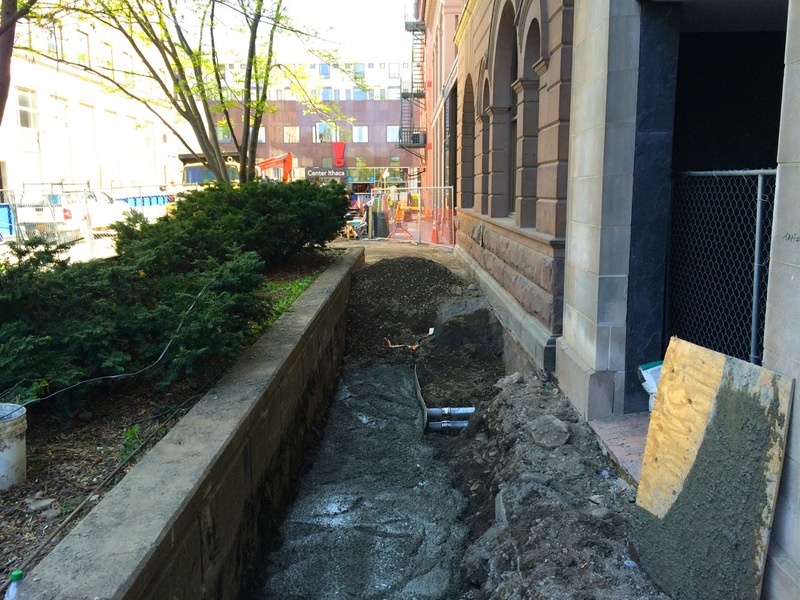 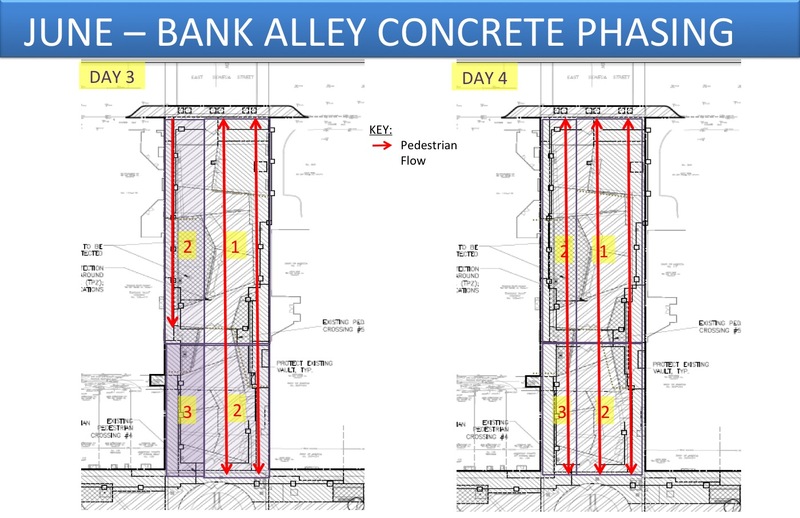 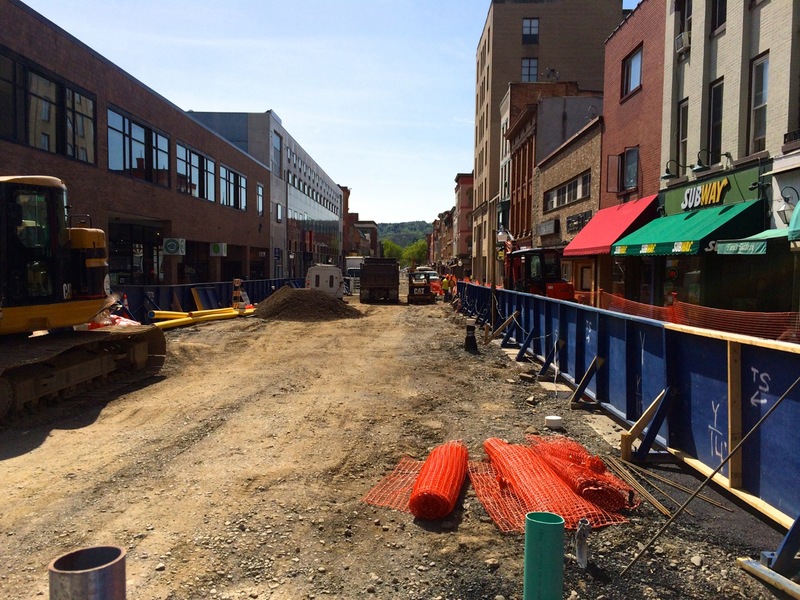 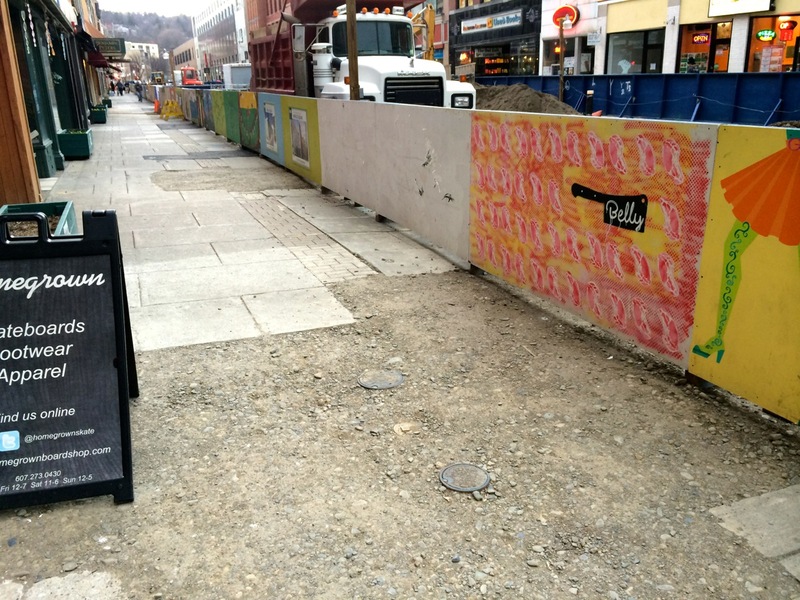 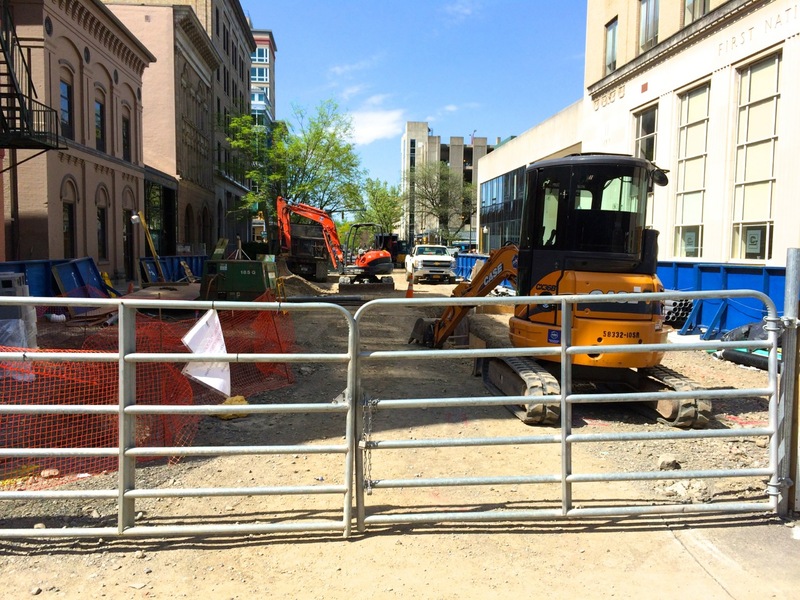 Because the concrete can be poured section by section, and dry time is relatively fast for concrete, the surfaces will be opened-up to pedestrian traffic, starting with Bank Alley, then the east 200 Block, and west 100 Block.